The Individuals with Disabilities Education Act 2004 (IDEA) is a strong federal law that protects all children with disabilities. Under the law, each eligible child is provided with specially designed instruction and related services that meet the child’s unique needs and enable him or her to participate and progress in the general curriculum along side typical peers—special education services. IDEA requires a written Individual Educational Plan (IEP) that outlines all the services and supports that the student will receive. This law establishes a key role for parents in planning and decision-making on behalf of their children and a process for settling disputes with the school if they arise. IDEA requires that all students have access to their school and that there are no barriers preventing students with disabilities from fully participating at school. The Every Student Succeeds Act (ESSA) was signed by President Obama on December 10, 2015, and represents good news for our nation’s schools. 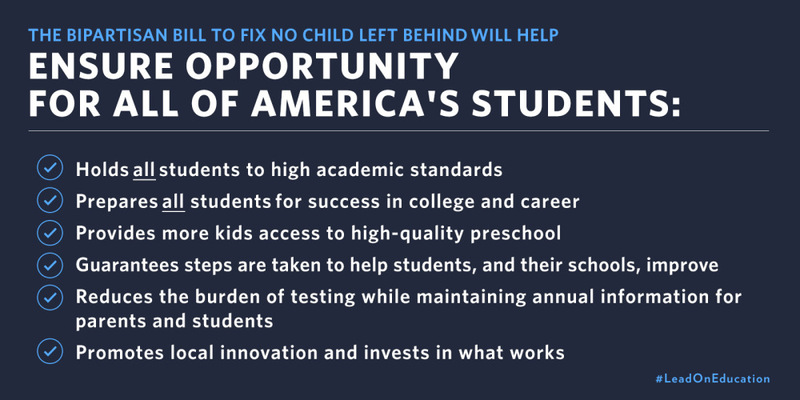 This bipartisan measure reauthorizes the 50-year-old Elementary and Secondary Education Act (ESEA), the nation’s national education law and longstanding commitment to equal opportunity for all students.